The Grand Fitted Quilted Mattress Pad Review - Is the Hype Real? What Is The Grand Fitted Quilted Mattress Pad Made From? How Does The Grand Fitted Quilted Mattress Pad Perform? How Do You Wash The Grand Fitted Quilted Mattress Pad? How Much Does The Grand Fitted Quilted Mattress Pad Cost? The Grand is just one of six brands under family-owned corporation Mastertex. This privately held New York-based company specializing in bedding products was founded in 2009. They design and manufacture comforter sets, duvets, mattress pads, pillows, and more for both retail and wholesale. Apart from The Grand, you may be familiar with their other brands: Luxurious, Morning Star, Reversefi, Royal Comfort, and Secure A Bed. The Grand Fitted Quilted mattress pad is one of their most popular and most reviewed products. Affordable and easy to maintain, it remains a consistently top-rated mattress pad on Amazon. Is its reputation well deserved? What are the pros and cons of using The Grand Fitted Quilted mattress pad? Let’s find out together below. Like most within a similar price range, The Grand mattress pad is made from polyester and cotton. The fabric used on the sleeping surface is a 50-50 polyester and cotton blend, while the quilting is padded with polyester filling inside. The quilting features distinctive but understated stitching. It’s different from the simple diamond pattern that’s used in mattress pads by Utopia Bedding or Luxor Linens. Instead, the stitching simulates a geometric pattern that tricks the eye. You may see hexagons, but really there are no closed shapes on the quilting. Note that there’s no cotton anywhere else on the mattress pad. 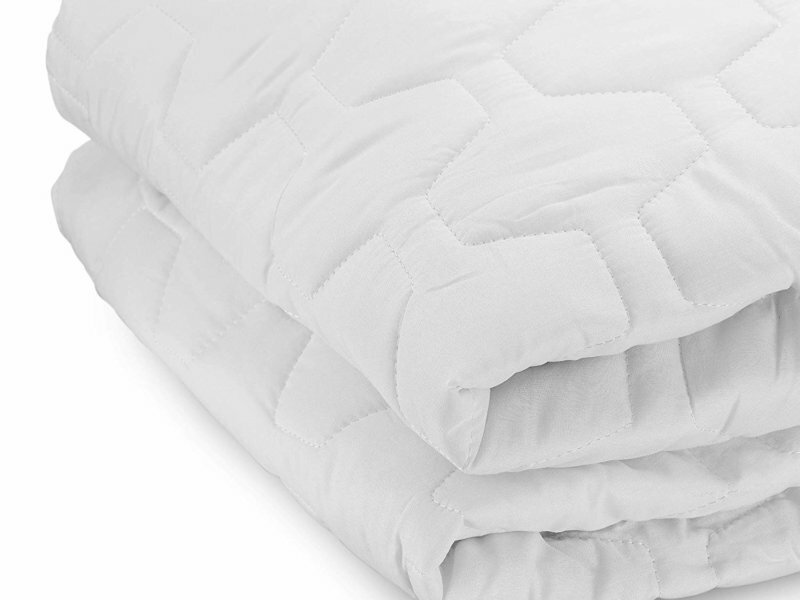 The base textile underneath the quilting and the fabric used for the “skirt”—what the bedding industry calls the sides of fitted pads, protectors and sheets—are both 100% polyester. The Grand mattress pad is not waterproof, as evidenced by this porous and breathable backing. The polyester material of the skirt is a stretch knit. The elastic added to the mattress pad to ensure a secure fit around your mattress goes all the way around along the edges of the skirt, too. It’s not just at the corners, like it is with some mattress pads. Will The Grand Mattress Pad Fit Your Mattress? One of the best features of this product is that it’s almost certain to fit your mattress. Unlike other mattress pads we’ve reviewed, The Grand mattress pad is sold in standard and non-standard US bed sizes. There are the usual twin, twin XL, full, queen, king and California king sizes. But they also offer the full XL, as well as rare daybed and three quarter sizings. The daybed option is 33 inches by 75 inches, and the small double or three quarter is 48 inches by 75 inches. We’ve covered length and width with the sizes above. Now let’s talk about the third dimension: depth. 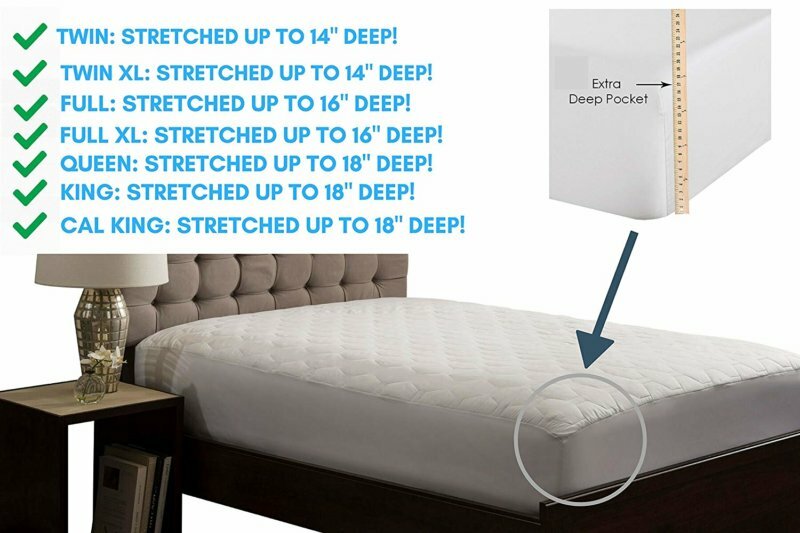 Mattress pad depth should be more than or at least match the thickness of your mattress. This is typically not a problem you’ll run into unless you have a bed that’s unusually plush or thick—like the 15-inch thick DreamCloud mattress, for example. Twin and twin XL will fit mattresses 14 inches thick at most. Full and full XL will fit mattresses 16 inches thick at most. Queen, king and California king will fit mattresses 18 inches thick at most. This is where the combination of the all-around elastic and the stretch polyester knit fabric of the mattress pad skirt shines. What’s the Big Deal About Offering a Full XL Size Mattress Pad? The inclusion of the full XL is certainly notable! Most large scale bedding and mattress brands don’t offer it as a size option. Don’t believe us? 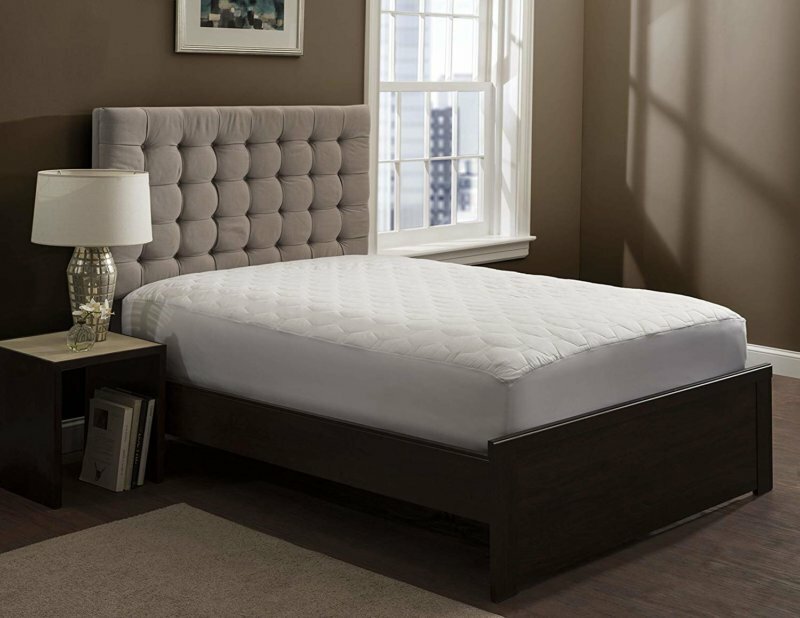 Check out our list of Good Night’s Rest mattress reviews and you’ll find that most, if not all, of our top-ranked choices aren’t available in full XL. If we’re going by online customer feedback, it doesn’t look good. The majority of complaints about The Grand mattress pad cite its lack of durability and inconsistent manufacturing quality. For such a highly rated mattress pad—and we did check reviews displayed on more than one online retailer for this—there’s a significant amount of alarming comments. Stitching quality was often mentioned. Some noticed loose stitches that probably compromised its durability right off the bat. 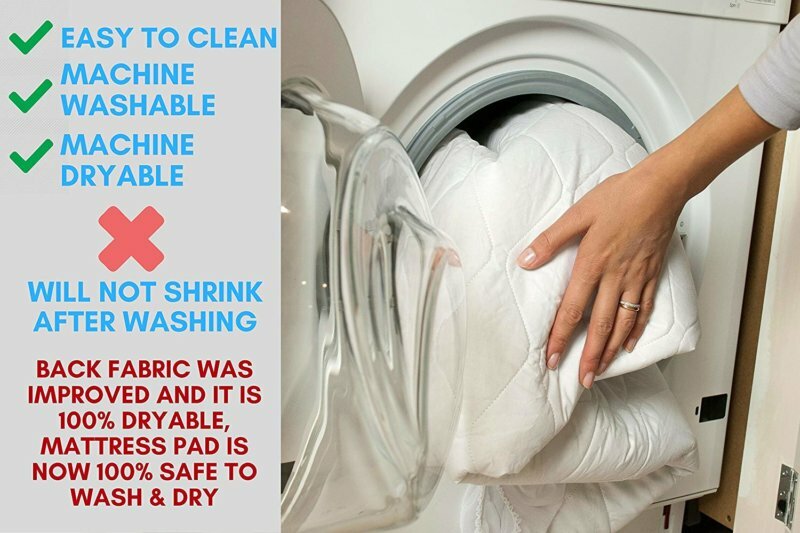 Many consumers reported that The Grand mattress pad was so flimsy that it fell apart completely after just one wash. Others noted that it tore easily, whether in the wash or while being slipped over a mattress. These stories may be from before The Grand improved the backing of the mattress pad, though, as we will tackle in detail further on. These verified customer complaints just about balance out the rave reviews mentioning how affordable it is, or how snug and perfect The Grand mattress pad is on thick beds. How Does The Grand Mattress Pad Feel? As the brand itself notes, this is a basic mattress pad. Once we saw this, we already had it in our heads to not expect too much. But what is a mattress pad actually supposed to do? To put it simply, it should give you a little bit of what you expect from both a mattress protector and a mattress topper. The Grand delivers on the former: The mattress pad does offer an extra layer between you and your mattress. This layer keeps your mattress surface safe from body oils, sweat, dust, dirt, minor spills, and other possible contaminants. It does not provide enough padding for there to be a discernible difference, though. The polyester filling does not add to your bed’s plushness. On top of this, the polyester element on the surface of the mattress pad may be felt through your fitted sheets if they are thin enough. This may not be a big deal to some, but to others it can be a deal breaker. Though there isn’t anything to praise in the way of plush comfort, there’s no issue with heat retention and breathability at all. If you sleep hot, you may appreciate this. Is The Grand Mattress Pad Hypoallergenic? The Grand Fitted Quilted mattress pad is marketed as a completely hypoallergenic product, and it is for the most part. Some consumers even went as far as to say that they slept on the mattress pad, brand new and unwashed, with no allergic reactions or any other issues. Cotton and polyester are popular materials for bedding because both are great for allergy-prone sleepers. There’s a caveat, though: If you have very sensitive skin or suffer from polyester textile dermatitis, you may find The Grand mattress pad anywhere from slightly itchy to impossible to use. Does The Grand Mattress Pad Smell? There have been no definitive reports of odorous off-gassing observed when unpacking The Grand mattress pad. Should you notice a slight smell coming from your The Grand mattress pad, just leave it in a well-ventilated area for a few hours and the scent should dissipate. It may have come from the plastic packaging. The Grand insists that their basic mattress pad is both machine washable and machine dry-able. It should be a relatively easy maintenance routine: change and wash every two or three months. Machine washable means you should be able to just throw it in the wash without worrying about it. The brand even provides the image below on the mattress pad’s Amazon page to assure us that the product is “safe to wash and dry”. However, we came across customer feedback—some using very strong words—that were very angry at the assertion that The Grand mattress pad is machine washable. Reports of the mattress pad coming apart, tearing, bunching up and even “melting” are not uncommon! You can search for them yourself on retailers like Amazon or Overstock. Many of these negative experiences may have been before The Grand improved on their mattress pad by changing the back fabric. This could be why some feedback referred to an inexplicable “melting” of the mattress pad even when using low heat or cool settings. However, that there are reports of the polyester filling bunching up in places is a real concern. It’s even quite understandable if you look at the quilting pattern with no closed shapes. This is a big point against The Grand mattress pad. Our advice: If you’re concerned that the mattress pad will fall apart, consider hand washing or just airing it out under direct sunlight when it comes time to change it for the first time. If you’re fairly certain that you will be washing your mattress pad more often than usual—that would be at intervals shorter than eight weeks—you may be better off with a different mattress pad. As of this writing, one queen size The Grand mattress pad is available on Amazon for $22.99. You can also purchase a queen size two pack for $43.99. Not all sizes of this mattress pad are sold in packs of two. Only the most popular ones have this bundled option: twin, full, queen and king. Does The Grand Offer a Trial Period, Return Policy or Warranty? There is a 100% Satisfaction Guarantee mentioned on the Amazon product page for The Grand mattress pad, but there’s no detailed information about it. Returns are often mentioned in customer feedback, though. It may be because they are taking advantage of an online retailer’s separate return policy. We’ve looked thoroughly and couldn’t find any mentions of dealing directly with The Grand or Mastertex. Visit Amazon & Find The Grand Mattress Pad Deals Now! The unparalleled sizing selection and the affordable price make this mattress pad attractive, but there’s little to go on past those. We can’t recommend The Grand mattress pad unless it’s for a bed that won’t be used regularly. This is not a workhorse mattress pad, but more of a pinch hitter. You may use it as an interim mattress pad while your dependable one is in the wash, for example. Or you can bring it along when you travel, if you’re the type that uses mattress pads on hotel or hostel beds. The Grand mattress pad’s high ratings online may be the result of two things: the “you get what you pay for” mentality, and people that review products immediately upon receiving them. Whatever the case may be, this is a lesson in looking past the surface. A top-rated product isn’t always at the top of its game in actuality.